Do you have uneven or thin eyebrows? Is drawing or colouring your eyebrows a daily challenge? Permanent makeup will make you look your best at any time of the day. Van Lennep Kliniek is a reliable address for permanent makeup treatments in The Hague. At our location on Willem Witsenplein, we work with the best equipment, and we have the right hygiene and safety permits. PMU or permanent makeup is very suitable for the eyebrows. It creates perfectly shaped eyebrows, giving the face a beautiful appearance. An effective treatment starts with an intake. During the intake, you can express your wishes and expectations. The permanent makeup specialist will discuss the options with you and will give you honest advice. Together, you can find the most suitable shape and colour. Applying permanent makeup is safe and hygienic. The pigmentation liquid is applied through a fast-moving, ultra-thin needle. This liquid is skin-friendly and anti-allergenic. 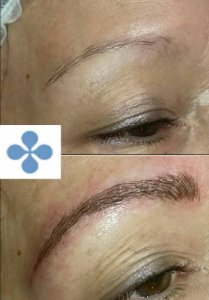 To apply permanent makeup in such a way that it makes you look great, knowledge, experience, and using the best products and tools are essential. Before we apply PMU hair strokes, you need to apply Emla cream (this topical anaesthetic is available through a doctor/pharmacy) on the area around the eyebrows. A treatment lasts approximately 1,5 to 2 hours. After you have had your first treatment, the second treatment can take place after 6 weeks. For a perfect result, 2-3 treatments are needed. No, to ensure that the treatment causes little or no pain, we apply the EMLA anesthetic cream. This is available at the pharmacy on prescription when you report that you want a permanent make-up treatment. The guidelines of the GGD require this if an anesthetic cream is used. When is the result visible? The result of your PMU treatment is immediately visible. Please keep in mind that in the first week after the treatment, the colours are darker than intended. The intensity of the colours will decrease by roughly 40% in the following weeks. After about 3-5 weeks, you will see the final result of the colours. Tip! Never apply a permanent makeup treatment just before an important event. Please schedule it well in advance, or afterwards. After the permanent makeup has been applied, a slight swelling of the skin may occur, which can last several hours. Because pigment is applied to the skin, small scabs may also form on the treated parts. These will shed naturally. Therefore, we recommend you to not apply your own makeup directly after the treatment, as this can cause extra irritation. From a hygienic point of view, it is not advisable to go swimming or to go to the sauna during the first 8 days after a treatment. Please schedule your treatment well before a holiday, or after. While your skin is recovering, the pigmented areas are particularly sensitive to UV light. Again, it is advised to avoid exposure to UV light until about 8 days after the treatment. In addition, you can take a look at client instructions for aftercare permanent makeup. To really make your eyes pop, it is important to emphasise the eyelids and eyelashes. By using different colour combinations, the permanent makeup specialist can refine the appearance of your eyes. To create full, natural eyelashes, pigment is applied in between the hairs. This technique can optically correct eyes that appear too big or too small compared to the rest of the face. This ensures that you always have beautiful, expressive eyes.